On this day we gather as a community of faith to worship and glorify our Lord and Saviour Jesus Christ. Our worship begins at 8.00am sharp and ends around 9.30-9.45am. Our worship style is a mix of traditional and contemporary flavour with singing of both hymns and contemporary praise songs. We have a regular order of worship, beginning with welcome, call to worship, worship & praise, prayer & intercession, tithes & offering, scripture reading, sermon and benediction. Hymns will be sung in between. On every first Sunday of the month we celebrate the Lord's Table with Holy Communion. Holy Communion is also observed on special services like Watchnight Service which we observe every year at 11.00pm on the last day of the year. We put emphasis on improving our community life after service through events like the Kopitiam Fellowship and the Communion Breakfast. We receive typically 200 - 250 worshippers every Sunday but the attendance usually increase during year end term holidays, on Easters and Christmases, to over 300. 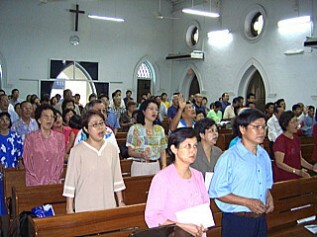 In recent times the church has seen a strong increase in the number of visitors and the membership have also grown. If you have not worshipped with us and will be in Seremban, we wish you welcome and may your time spent be fulfilling.